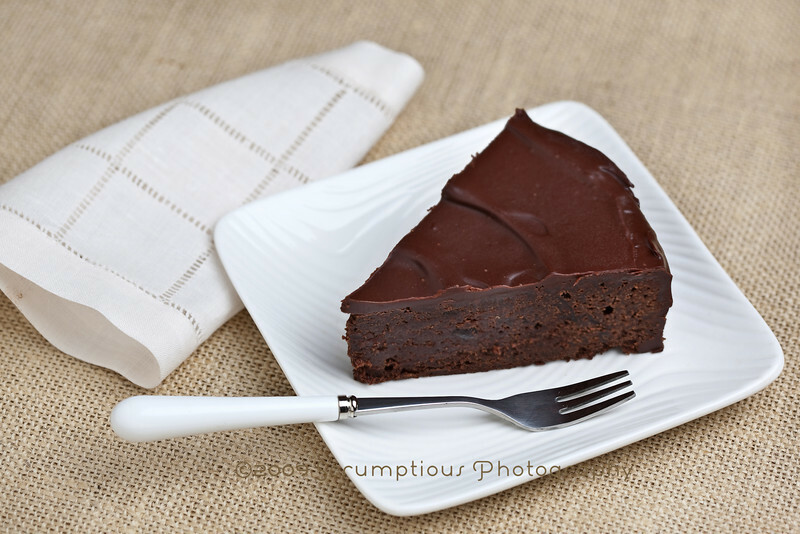 Chocolate Armagnac Cake, chosen by LyB of And then I do the dishes as this week's TWD recipe, has one of the more amusing backstories in Dorie's repertoire. It's the cake that got Dorie fired! As the story goes, she once substituted prunes and Armagnac for raisins and Scotch in this cake, and was subsequently booted from her restaurant job. 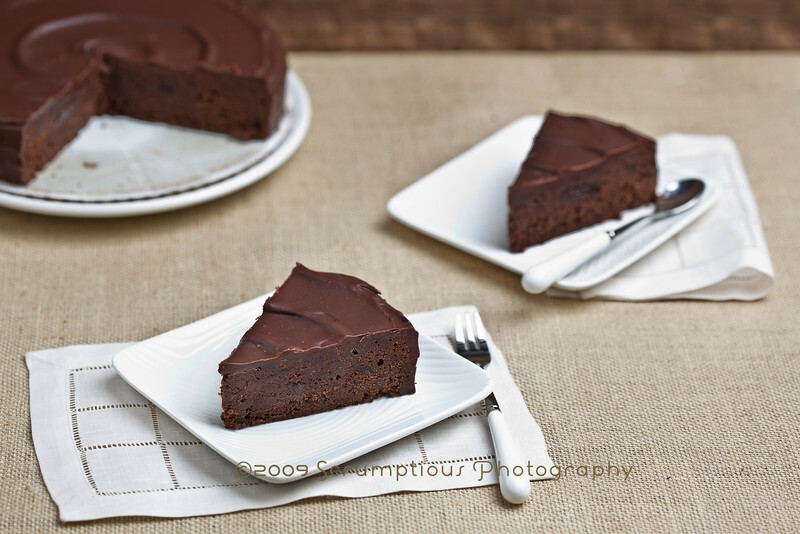 Though it sounded a bit weird to me to have prunes in a chocolate cake, they did give the cake a lot of moisture and sweetness. I thought they were a nice addition (even though I forgot to cut them up, so I ended up with whole prune chunks). 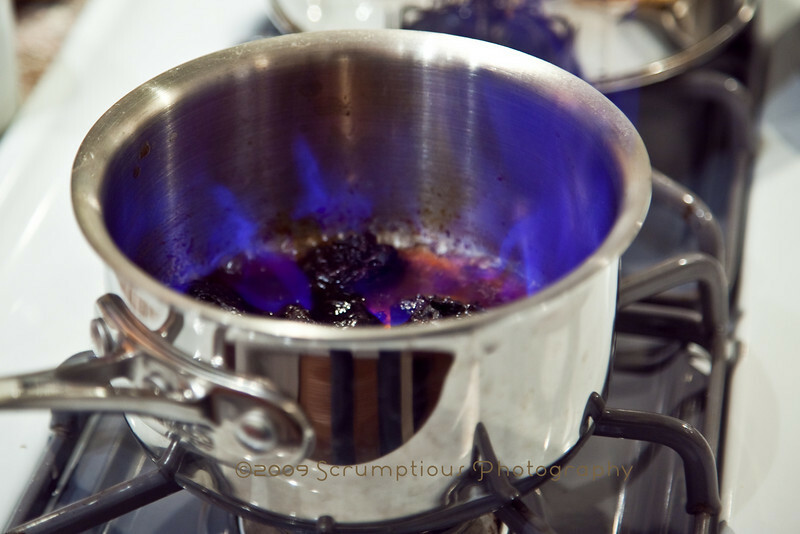 I had a lot of fun flaming the prunes! ;) I used Scotch whisky instead of the called-for Armagnac, since I couldn't think of any other foreseeable use for the Armagnac. I ended up not being able to taste the flavor of the Scotch too much in the end product, although the kitchen smelled Scotch-tastic for most of the baking process. I also used almond flour instead of the ground pecans, because, well, I am lazy and I already keep almond flour in the freezer. 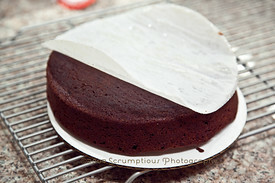 Beaten egg whites gave some structure to the cake. 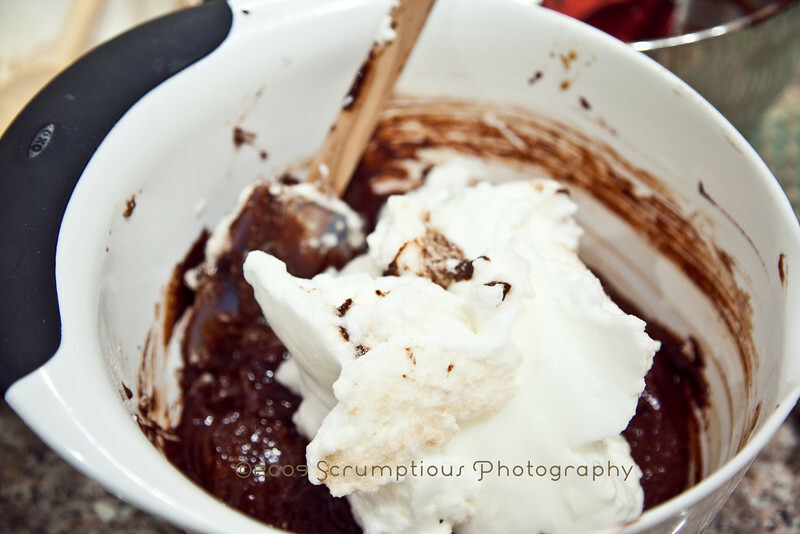 The glaze was a mix of melted chocolate, powdered sugar and butter, AKA deliciousness. Here are the recipe ingredients and nutrition facts! Be afraid, be very afraid. I finally got wise and calculated the nutrition facts BEFORE eating this cake;) It didn't stop me from eating it, though. Sigh. Many thanks to LyB for this week's pick! 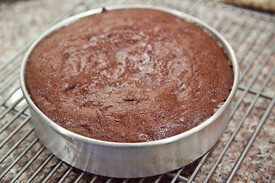 Head over to her blog for the full recipe, and look at the TWD blogroll to check out the plethora of cakes. oh gosh.. *phew*.. thank god I only had a little slice of that cake. Gorgeous lucious textures though. and i must say, your photos are soo beautiful! 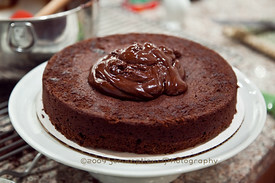 I am a real choc addict and this cakes looks so yummy delicious, that i really wish i had atleast 2 big slices. As usual, Kim... the pictures are wonderful, the cake is mouthwatering and colors and textures totaly out of this world! bravo. Beautiful! This cake was delicious, and I skipped right over the nutritional stats today! I don't want to know, right? ;o) Great pictures, as always Kim! 600 calories?!?!?!?!!!! WHAAAAAAAAAAAAAAAAAAAAAAAA???? Good thing I didn't eat anymore of this cake! 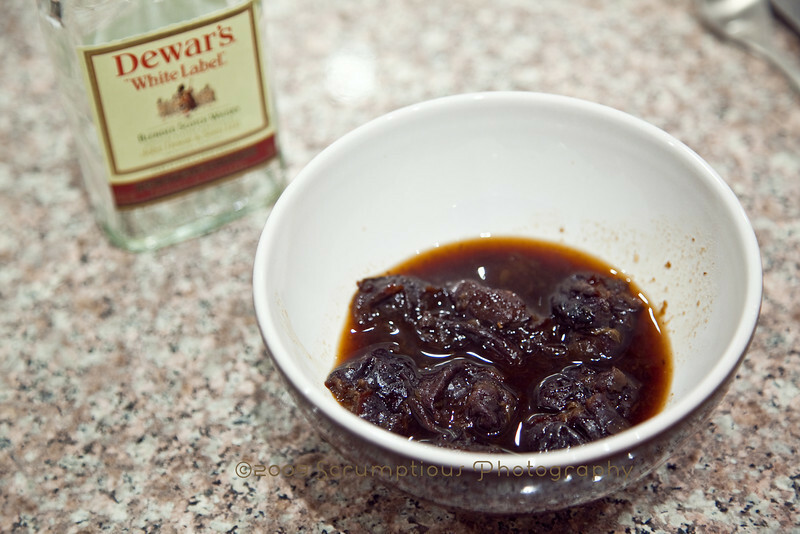 Love that you flambeed the prunes with Dewars. For that, my father would have loved this cake! hahah! It is gorgeous, your frosting is perfection! Oh my, look at those calories!!! Wow. Luckily you can really only eat a tiny bit at a time, it's so rich and adult tasting. I couldn't make myself click to find out the nutrition information. Gorgeous cake! tes photos sont fantastiques ! au diable les calories..quand on aime on ne compte pas ! lol ! 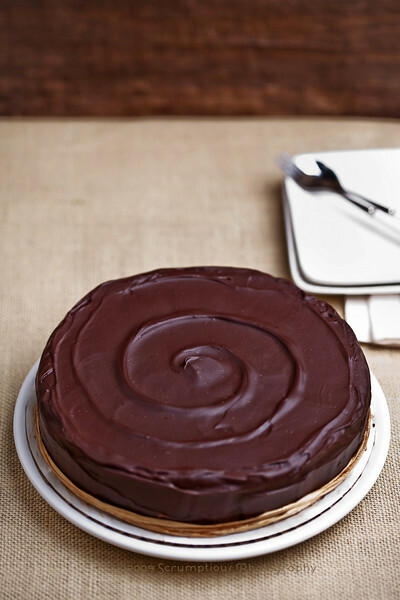 how on earth did you get that perfect swirl on the top of the cake!! that looks just gorgeous! I used scotch whiskey also and thought it turned out really good. Glad you liked it! your cake looks beautiful, love that chocolate swirl on top. Loving the swirl! I really enjoy your great posts and fantastic photos. Gorgeous pictures as always. This might be the one (and only) time that I am happy to read your (evil) nutritional stats b/c it make me feel less slack about not making it. HAHA. Just beautiful!!! The glaze looks so very yummy too. Ooh, nice picture documentary of the whole process. I couldn't get a nice shot of the flaming prunes... my camera just would not capture the flame. Anyway, yours cake looks fantastic! It looks marvelous and any kitchen described in any way as scotchtastic is somewhere I've got to be. Amazing flame picture! I'm thinking of using Scotch in mine, too, since I already have it on hand. Good Gravy! 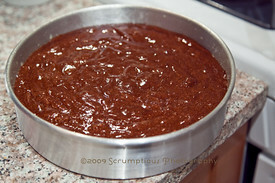 Your cake with its glaze looks so beautiful! The slice is perfection. I loved it and darn it....just went to the gym after I had some. A girls gotta do what a girls gotta do.....eat chocolate! :+) Its on my hit list for sure. Those calories are so worth it in this cake! I love the swirl on top of yours! That fudgey cake looks moist and delicious. Great pics. 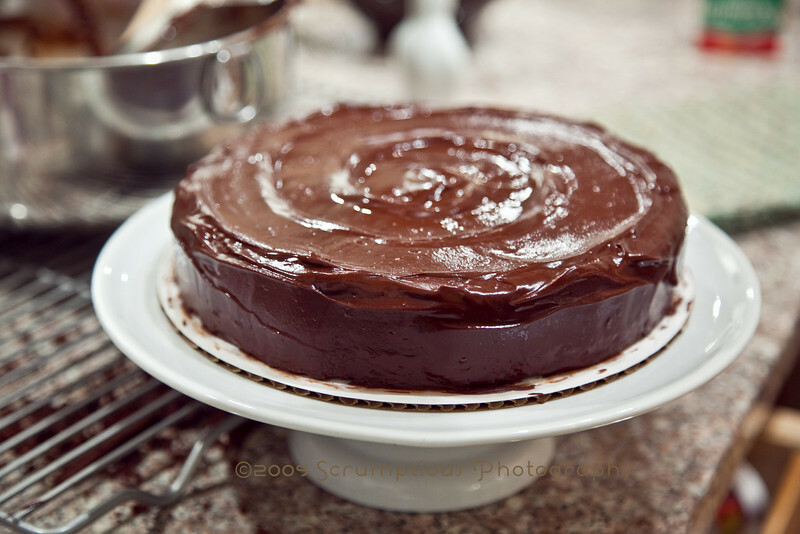 Beautiful, moist and delicious! Yummy job :). Would you pass one of those little slices to me please? Please?? 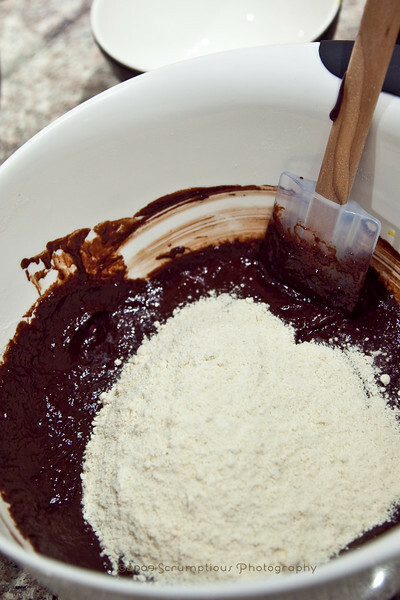 This chocolate cake will be my favorite. And prunes are great idea for it. This is a gorgeous cake. I was not tempted to make this cake at all until I saw your photos. I'm even thinking of... gulp... prunes. All the photos are lovely, as is the cake. My favorite, is the swirling on the top of the cake...such a simple thing and such an elegant touch! Great job.